(literally means lord of physicians) a temple dedicated to lord shiva in kangra district of himachal pradesh. It is located at a height of 3,608 feet.surrounded by mighty snow capped dhauladhar range of western himalaya . 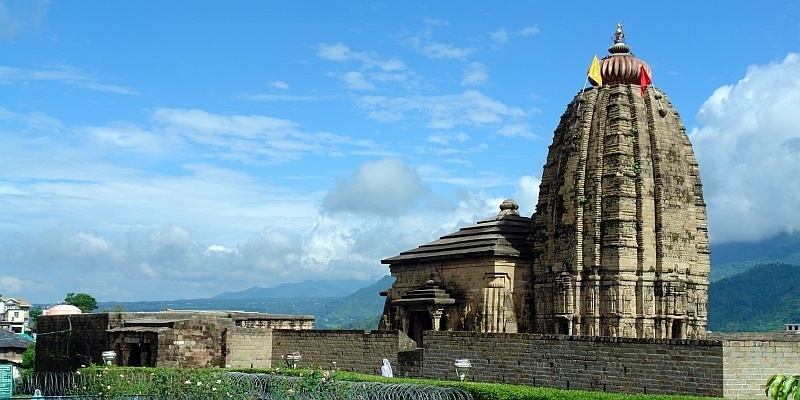 Baijnath temple was constructed in 1204 AD. It was here in this place where RAVANA(famous character if ramayana) did penance to please lord shiva thus offering his 10 heads to LORD shiva. He cut his 9 heads the moment he was about to rip his 10th head shiva appeared before him and granted him the boon. 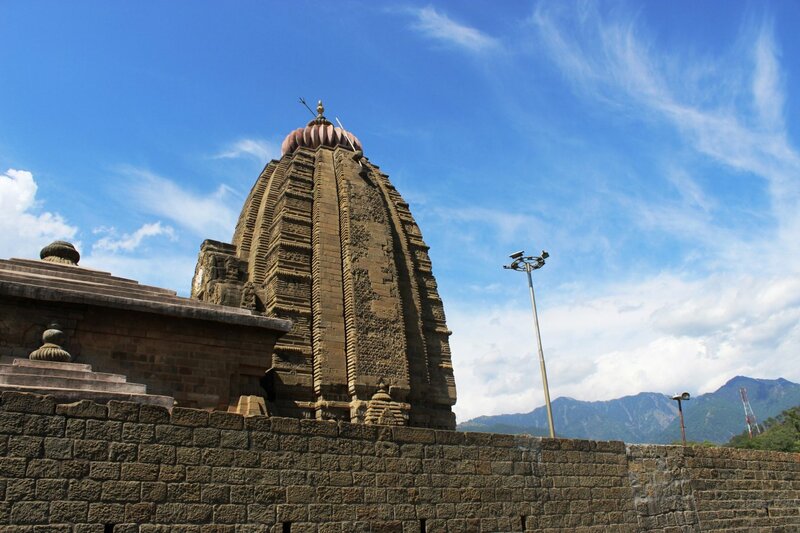 According to the inscriptions on the walls, Baijnath Mandir was built by the two native merchants by the name of Ahuka and Manyuka in 1204 A.D. In the porch of the temple, the two long inscriptions state that before the present temple, there was a shrine of Lord Shiva at the same spot. The structure of this temple gives the hints of the early medieval North Indian style of architecture. This type of structure used to be known as ‘Nagara’ style of temple. The architectural style has been imbibed from Orissan style, which is very much unique in the state of Himachal Pradesh. The exterior walls of the temple have numerous alcoves with images of gods and Goddesses from the Hindu pantheon. Another significance of this temple is that water of this temple is believed to have medicinal properties which can cure many diseases therefore it’s named as BAIJNATH(lord of physicians). Baijnath temple is open 12 Months 365 days. However , my personal experience suggest January – March as the best time to visit the temple. You will surprised to witness the aroma near the temple and I bet only temple where a sweet aroma can be felt. One can understand from where this aroma is coming. Where ever you go divine aroma will follow. How to reach Baijnath temple? It is set in the backdrop of the Dhauladhar Himalayan range, which is around 17 km from Palampur. By Rail: One can reach Baijnath by toy train which can be accessed via chukky bank ( Formally called as phathankot). User who is booking a railway for travel need to book ticket till chukky bank and then need to board toy train till Baijnath. It takes around 7 hours to reach. By Bus : One can also prefer travelling by bus ( Volvo and Normal Bus). One can board bus from Delhi ISBT or Chandigarh Bus stand depending which place user selects as a starting point. User can book HRTC (Himachal Road Transport corporation an official site for Himachal Pradesh Bus Booking). By car / Taxi : One can prefer travelling by own car or taxi. User can book zoom cars and for taxi booking call us at 7093700356. Their are multiple hotel booking options available. I’d suggest Yatri Niwas ( Himachal Pradesh undertaking). For booking call us @ 7093700356. Their are multiple options when it comes to near by places to baijnath. Few destination are Palampur, Chamunda Temple, Jwala ji Temple, Jakhni Mata temple. One can also spend time in Taragarh Palace, Tashi Jong Monastery, Bir-Billing. An easy gateway on a long weekend. 3 Night and 4 days is the best package one can avail to explore Baijnath and its near by place. For a detailed itinerary and package call us @ 7093700356.